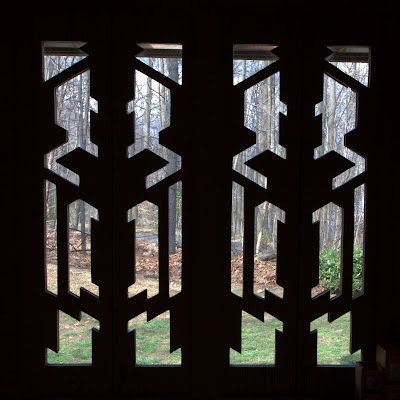 A silhouette view of the cutouts from the Pope-Leighy House designed and built by Frank Lloyd Wright for Loren Pope in winter 1940-41. Each Wright house had a unique design repeated throughout. This cutout is featured on clerestory windows all round the structure. The Usonian houses were designed to bring organic architecture to "every man". This 1200 square foot home was built for $7000. Canon 40D, 1/125s at f/6.4, ISO 400 with a 36mm equivalent focal length. 82 - "Damn Near Missed"